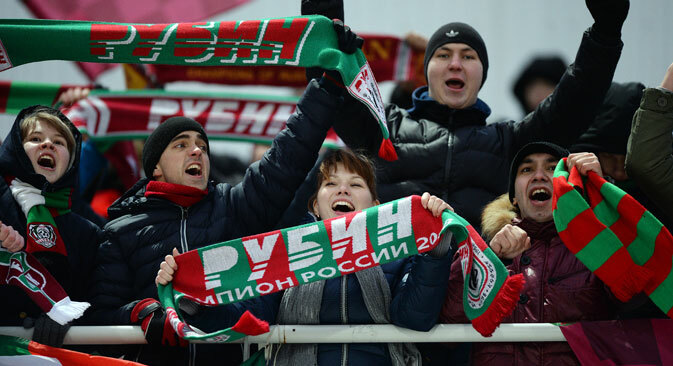 Rubin's fans celebrate a goal during the Russian Football Premier League championship's 14th round match between football clubs Ural Yekaterinburg and Rubin Kazan. France's Interior Ministry banned the visiting fans of Russia's Rubin Kazan from attending the game in France between their team and FC Girondins de Bordeaux on December 10 as scheduled on the 6th game day of Europa League 2015/2016. "The Kazan [football] club is sorry to inform our devoted fans that due to the latest tragic events in Paris, the French Interior Ministry resorted to a special decree to ban fans of foreign teams from attending football matches in the territory of the country," the press service of FC Rubin Kazan said. Kazan's club president received a letter from the French police explaining that the French Interior Ministry had issued a decree restricting Rubin fans from moving between any French border-crossing points and the Bordeaux commune. The French embassy to Russia offered its apologies and kindly asked Rubin fans to understand the ban. "Owing to the high level of terrorist alert and given the state of emergency in effect in France, the interior minister resolved to ban any movements of people, either traveling in organized groups of fans or individually, in order to ensure security of people and property," the French embassy said in a statement published on its official website. The embassy informs that 100 Ligue 1 (the French premier league) football matches are to be held in France, mostly in big cities, from November 30 - December 14. This restrictive measure predominantly concerns competitions among French clubs. But it will also affect clubs from many European countries that are to play in France as per the European tournament calendar. "Thus, any movements around France by Rubin Kazan fans or other persons acting as their supporters will be prohibited both at French border-crossing points and in the area around the city of Bordeaux from noon on December 9 until midnight on December 10, regardless of the means of transport actually used. Therefore, we strongly recommend this category of people to cancel their visit," the statement says. "We apologize for any inconvenience and hope for your understanding given the special situation in France following the November 13 terrorist attacks," it says.